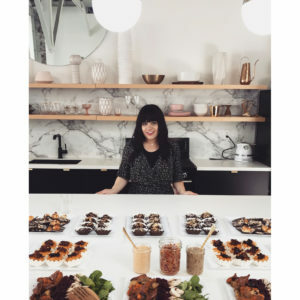 Cheddar Stuffed Latke Balls and Tomato Soup - Kosher In The Kitch! 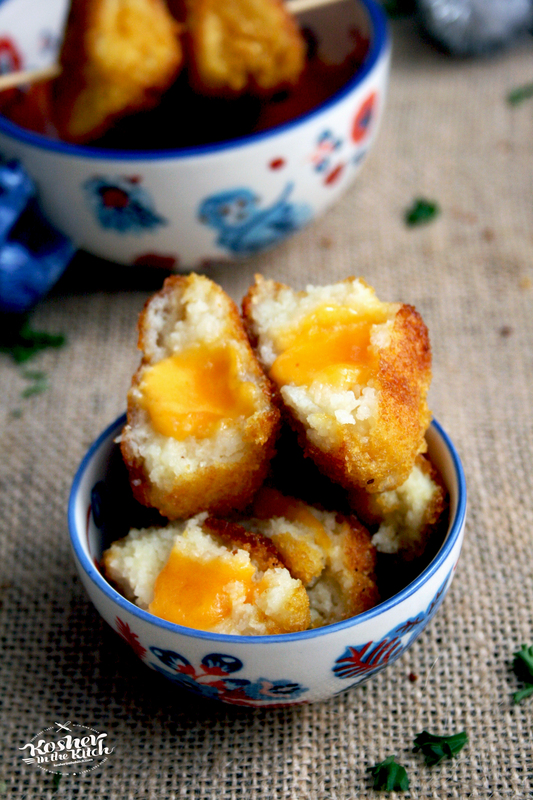 Cheddar Stuffed Latke Balls and Tomato Soup - Kosher In The Kitch! This year for Hanukkah I partnered with Manischewitz to bring you an all NEW Kosher in the Kitch Latke remix! This here is my take on the classic comfort food combo of grilled cheese and soup, Chanukah edition! 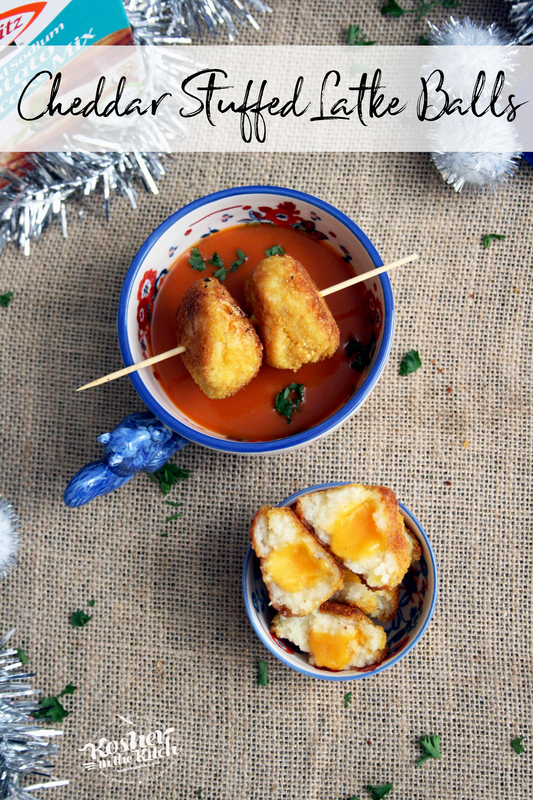 Crispy latke balls stuffed with creamy cheddar cheese served over savory roasted tomato soup. Beat 2 eggs then combine with water and add contents of Manischewitz potato pancake mix. Place in fridge for an additional 10 minutes to further thicken. 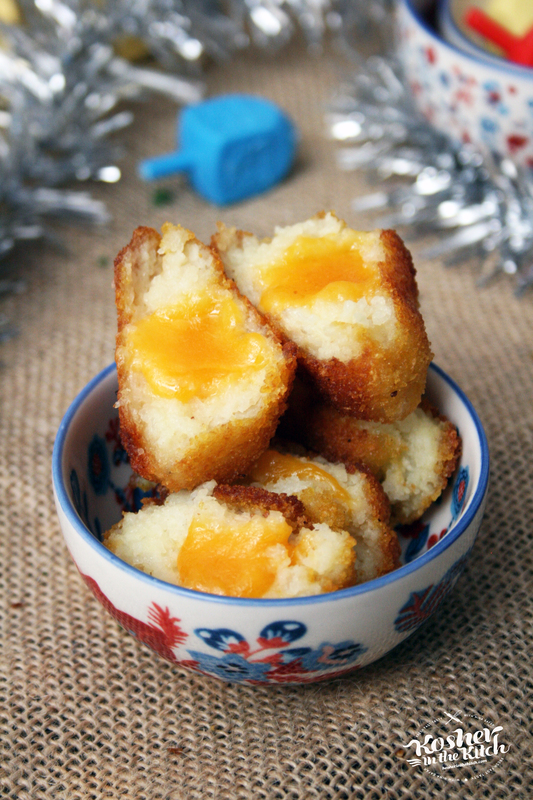 Scoop out about 1 tablespoon of batter then place in your hand and stuff a small cube of cheddar in the center, rolling the batter around to form a ball. Dip in eggs then corn flake crumbs and fry until golden brown on all sides. 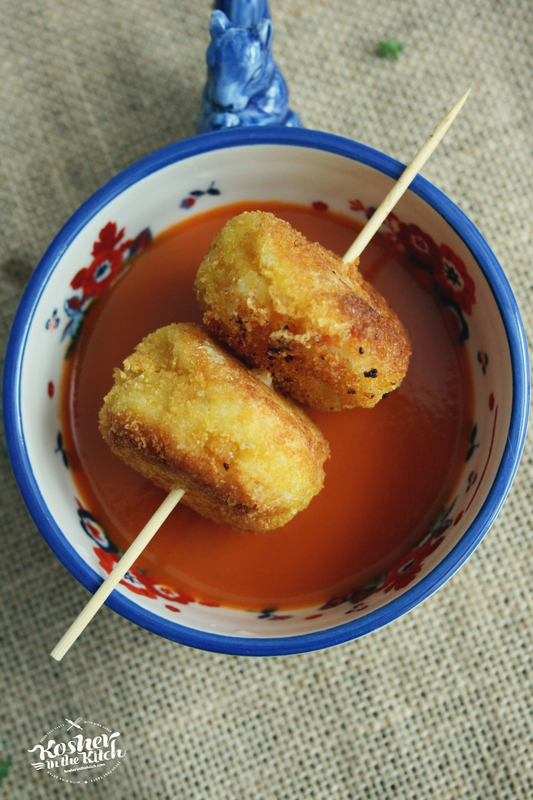 Skewer together several latke balls then serve over tomato soup. Place cherry tomatoes in a baking pan. Drizzle 1 tablespoon olive oil over the tomatoes and season with salt and pepper. Coat well. Place in oven on 400′ for 30-35 minutes until beginning to brown. Once the tomatoes are roasted, saute onions and garlic with remaining olive oil. Once golden, add the broiled tomatoes and allow to cook for 2 minutes. Add the broth and bring to a boil then reduce heat and simmer for 30 minutes. Puree with an immersion blender and serve with cheddar stuffed latke balls. ** This post is sponsored by Manischewitz. Manischewitz & Kosher in the Kitch are collaborating to bring you deliciously easy recipes using Manischewitz potato pancake mix.